Retention – During the summer of 2017 Pinemere Camp saw a 93% retention rate, which is 21% higher than the national average of 72%. For summer 2018 we are at almost 95%! Staff – We believe that a happy (and well trained) staff is a happy camp! In 2017, 96% of our Staff said that Pinemere had a great work environment and 98% said we have great leadership and professionalism. That is compared nationally to 73% and 79% respectively. Excellence – While we have a lot of data from the most important people, our campers, one piece of information sticks out and has been consistent for 3 summers: 92% of campers said they had an EXCELLENT summer vs 75% nationally. (FYI the other 8% rated camp as REALLY GOOD). Over the course of the last few summers we made a number of investments into camp. These included a new swimming pool, renovated tennis and basketball courts, a new septic system, and numerous decks and roofs. We also added a new aqua summit, rope swing, and stand up paddle boards to our lake. All of these were made possible by the generous support of our alumni, Board of Directors, current families, and other donors. There are a lot of amazing things happening at camp, but we’ll never be our best without the help of our Pinemere Family. 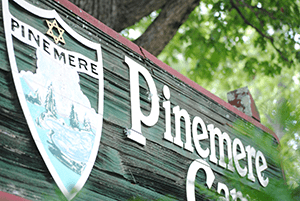 We hope that you will consider a gift to Pinemere Camp and help us invest in the future. Whether you’re interested in providing scholarship dollars to ensure that every camper can afford camp or you’re interested in helping with capital and program projects, there are a variety of ways that you can get involved. We’re happy to speak with you on the phone or in person to find the right opportunity. You also have the option of gifting stock! Please contact me for more information. As I mentioned in the beginning of this letter, I love Pinemere Camp and I’m proud to be “driving the bus.” Over the next few years we hope to lay the foundation for our future generations and for Pinemere’s next 75 years. With your help, I have no doubt that we will. We look forward to seeing you all at Pinemere in Summer 2018!